Eeeep! It's J.Lynn! And it's my favorite kind of story! Girl falling in love with her brother's best friend? YES PLEASE!!! And I loved Jase in WFY so I want this one now! Thanks Tanja! That stinks her books haven't quite done it for you- you're not the first person to say this though. Nice pick! Not my kind of read but still hope you thoroughly enjoy it! *flails* I love this pick! And I LOVE the main characters name *giggles* I cannot wait to meet my new boyfriend Jase hahaha. Lovely pick my dear friend! This book sounds awesome. I am definitely adding it to my TBR list. Thanks for sharing!! :D Thanks Jacque for stopping by! I loved the first book so I can't wait! This sounds very Romeo and Juliet but in a modern sense. I haven't read any of the author's previous books so I have no idea of their previous work. However, it is interesting enough to check it out. Thanks for sharing. Thanks for stopping by Olena! J.Lynn is one of my all time faves so I can't wait to read it! Hey, I've seen this one around already. I'm so ashamed that I haven't read anything by her yet but I sure will soon. Thanks for stopping by also Johanna! Nice pick! I am sure this will be a good one! Eeep! I can't wait! LOL. Awesome pick! I can't wait for this one either. 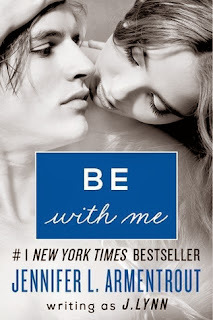 I pre-ordered Be With Me. I'm so excited to read it!! Lots of JLA books today, but they're all different! I don't know how she does it. Great pick! She is seriously a writing machine! Wait for Me was the first NA book that I didn't hate, so I'm definitely going to check out the sequel. LOL! I hope this one doesn't disappoint! Great Pick!! I loved Wait for It and am planning on reading Trust in Me soon :) J Lynn is an amazing writer so we know that Be With Me will be a good one! :D I am hoping to read Trust in Me in the next couple of days! I can't wait! I LOVE the name Jase too!!! I haven't yet met Jase Garrett, but man, do I want to! I've never read a JLA or J. Lynn book, but I LOVE stories where the girl fals in love with her brother's best friend! I might have to get into this series soon! Me tooooo! I love those romances! They're my favorite! You need to read a JLA book!!! You need to! Gaston? From B&B?? He kinda does! LOL! You are so funny! I'm kind of scared to admit that I've never read a J.Lynn book. This does sound really interesting, though. I hope you love it! Great pick! Aww don't be scared to admit that Natalie! But she is definitely worth checking out! Ah! I haven't read the sneak peek yet! I can't wait!!!! AHHHH great pick Jessica! I. CAN'T. WAIT. FOR. JASE! :D Thanks Ally! I can't wait to flail over this together! I can't wait for Teresa and Jase's story! They definitely intrigued me in Wait For You. Great pick! Yes! I definitely liked both of their characters! I've still yet to read any of her books! Everyone loves them so, though, so I'm going to have to do so one day. :) Great pick!! :D Right?! She is amazing!!! This will be a good one too!! JLA rocks! !